Each way betting (EW or E/W) is a popular form of betting, usually done on horse racing. It can be used by bettors as a form of insurance should their chosen horse/horses narrowly fail to win. The place part of the bet effectively increases their chance of making a return, even if it’s not the full amount a win would have brought. An each way bet is a bet made up of two parts: a WIN bet and a PLACE bet. Two bets of equal amounts are made; the first on a selection (horse) to win and the second on the same selection to place. A ‘win’ obviously means that the horse finishes the race first. The ‘place’ means that it finishes in any of the top positions. The exact number of positions paid out on a place bet varies bookie to bookie, but it’s usually the first 4 or 5. When you bet £10 each way, you aren’t just betting £10. This is a pretty common mistake, so don’t worry. £10 ‘each way’ means that you bet £10 on one outcome and £10 on another outcome. In this example, this bet would have cost £20. Make a selection and decide how much you want to bet each way. Place a WIN bet on the horse to finish 1st. Make a PLACE bet on the same horse to either win the event OR finish in one of the specified places. This depends on the bookmaker but will probably be 1st, 2nd, 3rd, 4th, 5th etc. Remember: each bet MUST be an equivalent stake. For example, a £10 each way bet means your total stake is £20. The odds on the PLACE part of the bet are calculated as a fraction of the winning selection odds: 1/2, 1/3, 1/4, 1/5. The number of specified places and associated fractional odds are dependent on the bookmaker, sport and event. Make sure you check the T&Cs. If your selection finishes 1st, both the win and place parts of the bet will return a profit. If your selection fails to come 1st, the win part of your bet loses…. However, if it finishes in one of the specified places, the PLACE part of the bet will give you a return. 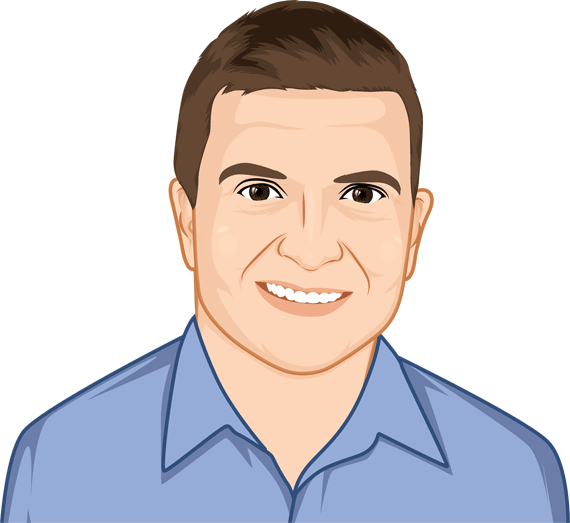 For a step-by-step walkthrough of how to place an each way bet, check out this post. 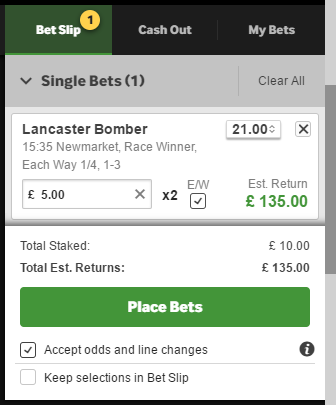 What if my each way bet is a non runner? Each way bets can be affected by the withdrawal of other horses from a race commonly referred to as a non runner. If a runner withdraws from the race the chances are that the terms of your bet will alter. For example, in a field of 8 runners the fractional odds are 1/5 for 1st, 2nd & 3rd place. If a runner was withdrawn from running, the field would be reduced to just 7 runners. Therefore the fractional odds would reduce to 1/4 for 1st & 2nd places only. In a field of 5 runners the fractional odds are 1/4 for 1st & 2nd place. If a runner was withdrawn from running, the field would be reduced to just 4 runners. Therefore, your each-way bet will turn into a single ‘WIN ONLY’ bet. Which sports does each way betting work on? 8+ runners: 1st, 2nd & 3rd place @ 1/5 odds. Big horse races, such as the Grand National, usually see a lot of novice punters betting each way. Tournament-based competitions, such as the FIFA World Cup (football), the Masters (golf), Formula 1 (motor racing), greyhound racing and cycling competitions all provide opportunities for each-way betting. In fact, any sporting event comprising of multiple competitors will provide clearly defined ‘places’ for each way betting. However, individual football, boxing, rugby, tennis, snooker and darts matches only provide a winner and a loser and therefore aren’t suitable for each way betting. The each way terms available differ depending on the sport, competition and market. Always check the T&Cs! The selection finishes the race in 1st place. The selection finishes the race in 2nd or 3rd place. The selection finishes the race in 4th – 8th place. Decimal odds are pretty straight forward once you get the hang of them. For standard back bets you simply multiply your stake by the decimal odds to calculate your total return (including your stake). Your profit is then your total return – your stake. Multiple each way bets are settled on a WIN-to-WIN and PLACE-to-PLACE basis. For instance, if all but one of your selections wins and the remaining selection only manages to be placed, the WIN element of the bet is void. The same outcome would occur if one selection wins but the remaining selections only manage to be placed. Basically, you won’t receive a greater return of winnings because more of your selections win. Still, you will receive a return for the place element of the multiple each way bet. If just one of your selections fails to win OR place, the entire multiple each way bet is void. It is important to remember that should your first selection win, the returns from that bet DO NOT become the stake for subsequent selections. Similar to an each way single bet, a double is two bets: a WIN double and a PLACE double. If one of your two selections wins but the other only manages to place, the win element of the each way double is void. However, you’ll still receive a return for the place element. An each way treble is also two bets: a WIN treble and a PLACE treble. If one of your three selections wins, but the other two only manage to be placed, the win element of the each way treble is void. However, you’ll still receive a return for the place element. An each way accumulator follows the same principles as an each way double or treble. The only difference is that the number of selections made is chosen by the bettor instead of the bookmaker. The each way odds are equivalent to, or are in excess of, 5.0. The odds are then in your favour, insuring that your win bet and total stake are covered, should your selection finish in a specified place. You are not considering the favourite in the market. It’s highly unlikely that you will find a market favourite of a sporting event with each way betting odds that are greater than 5.00. You don’t have 100% confidence that your selection will come first but you still feel that it is capable of finishing in one of the specified place. Your selection has high odds but you still feel that it has a very good chance of finishing in one of the specified places. The each way odds of your selection are less than 5.0. In this instance there is no value in betting each way. You would only be minimising your potential losses as opposed to covering your win bet stake. 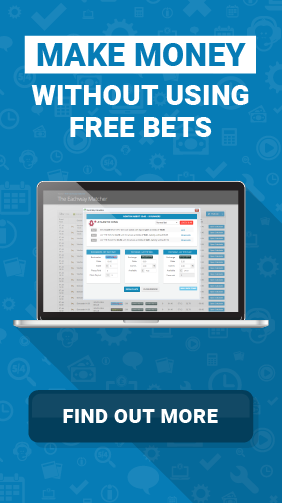 OddsMonkey have built a whole suite of tools designed to help you earn money through different aspects of matched betting. In fact, we’ve got one to do this very job. EachWayMatcher helps you find the latest odds and make money from horse racing, without the need for free bets.